In June 2015 Oxford Brookes University in partnership with BMW Group launched an innovative new undergraduate programme offering students the opportunity to master both business and automotive management subjects, through studying abroad and gaining valuable industry experience with a major employer. The BSc (Hons) Business and Automotive Management is a specialist programme within the university’s Business School. 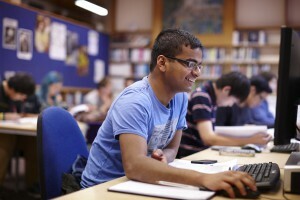 During the four-year programme students spend their first and final years of the course studying at Oxford Brookes. The second year they study in Germany at the OTH Regensburg, Technical University of Applied Sciences and the third year they spend in work placement; six months in Germany at BMW Group Plant Regensburg and six months locally at the MINI Plant Oxford. BMW Group support students’ learning and development throughout the programme via a mentorship scheme involving BMW Group managers drawn from a variety of organisational functions at both BMW Plant Regensburg and MINI Plant Oxford. Students have the opportunity to boost their language skills, studying a German language module through the university’s Department of English and Modern Languages, and also studying the language whilst in Regensburg. They will also complete an engineering module within the university’s Department of Mechanical Engineering and Mathematical Sciences (MEMS) in order to understand the technical side of the business, which BMW Group requires of their graduate employees. With the introduction of this programme, Oxford Brookes is building upon a long-established relationship with BMW. The University is proud of its partnerships with BMW Group which extends from apprentice training on foundation degrees, through to research and development activities such as the high profile MINI E trials. The two organisations have also shared significant achievements such as the notable 150th anniversary of Oxford Brookes in 2015 where BMW Group featured strongly in the celebration of engineering heritage. While this course is focussed on the automotive sector, it has wide appeal and will also enable students to go take up positions in a range of other settings nationally or internationally, including multinational business, charity or education sectors, healthcare and government. In 2016/17 the Business School will be moving from the University’s Wheatley Campus to Headington Campus as part of Oxford Brookes’ 10 year estates investment plan to improve the quality of teaching and learning facilities and provide a consistent experience for students. Over £20 million will be invested in new buildings and learning facilities for business school students.